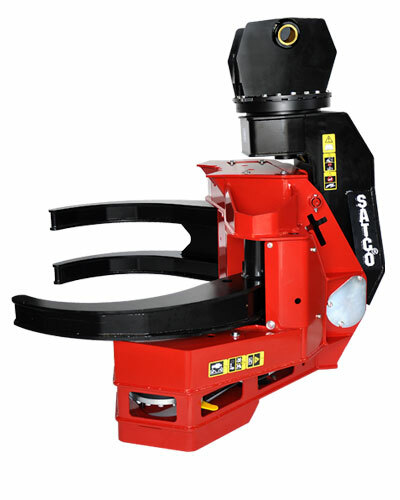 The SAT630 is a 30 Inch Directional Felling Head & Loading Grapple which has been proven in all parts of the world. It is a very versatile unit enabling operators to fall, bunch, stack and shovel whole stems. The 360 degree continuous rotation allows falling in any possible direction in relation to the base machine. SATCO® has units extensively servicing New Zealand, Australia, the United States, Brazil, Chile, Asia, Africa and Canada. The unique SATCO® ‘Hose Through Centre’ connection to the base machine allows the hoses to travel through the centre line of the attaching pins. This prevents the hoses over–bending, causing premature failure and protects the hoses from damage, especially in tree felling applications. The SAT630 Felling Grapple saw unit is supported by a large 30cm (12”) diameter slew bearing making it a very robust unit, especially when falling. The saw is a heavy duty auto chain tensioning saw with a 43” bar and a 3/4” chain. SATCO® also use a unique locking system for the saw sprocket to prevent broken drive shaft keys and damaged saw motor shafts. The SAT630H has no electrical system down to the felling grapple which makes it easy to maintain and allows the operator to quickly change to a loading grapple with ease. The SAT630E is a Harvester Ready option which makes installation on a harvester ready base easier and can be run in conjunction with a harvester. 360 degree continuous rotation makes falling large diameter trees easy, a front cut can be put into the tree without having to reposition the base machine. The SAT630 is constructed using high grade materials and manufactured using the best robotic welding wire for a far superior weld. Weighing in at 2000kgs (4400lbs), and requiring 200lpm (52.8gpm) (US) at 280bar (4000psi) the SAT630 felling grapple can be attached onto any base machine in the range of 20 – 40 tonne. As well as running the SAT630 on larger carriers, the SAT630 can also be run on a small carrier as the horsepower requirement is minimal compared to running a fixed disc saw head. These factors all amount to less base machine stress and great fuel efficiency. This enables you to increase your production while bringing down running costs.